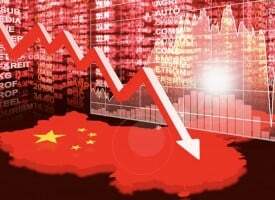 On the heels of some fierce trading this week in the dollar, gold and silver, below is an extremely important update on the war that is raging in the gold and silver markets. King World News note: Below you can see the commercial hedgers have added aggressively to their short positions in the gold market this week. There was very little change in commercial short positions reported for this week (see 10-year chart below). That does not mean that the price of gold cannot continue heading significantly higher in the short-term, but it does raise a caution flag. 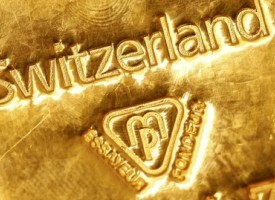 King World News note: Sometimes it’s important to take a step back and look at the big picture in the gold market. Looking at the 23-year chart below, the commercials are now very close to all-time record short positions in the gold market (see remarkable 23-year chart below). Commercial Short Positions In Silver Near All-Time Record High! King World News note: Below you can see the commercial hedgers position in the silver market market remain near all-time highs in terms of their overall shorts (see 23-year chart below). The commercial shorts are at a level that raises serious concern. In fact, the commercials now have one of their largest cumulative short positions in history. 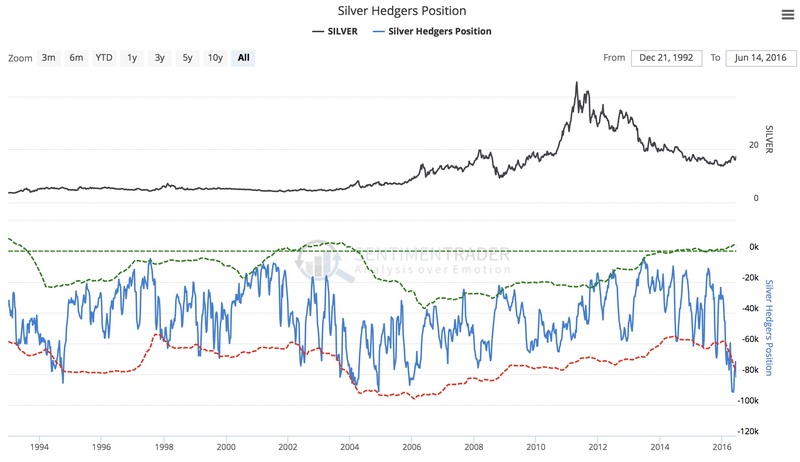 The last time the commercials held this large of a short position in silver was in 2006. Again, that does not mean that the price of silver cannot head significantly higher in the short-term. What is important to note on the chart above is that when the commercials were this short silver in 2004, there was a brief 12.7 percent pullback in the price of silver, but over the next 18 months the price of silver more than doubled from the low of that pullback in 2004. So from late November of 2004, when the price of silver fell to about $6.70, the price of silver soared to $14.31 by early May of 2006. 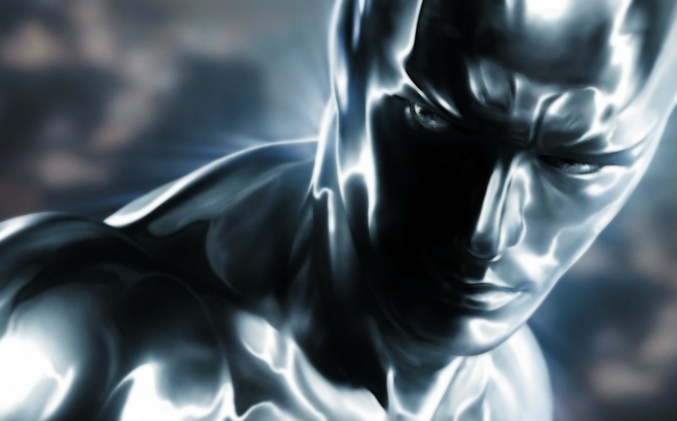 Nevertheless, the commercials now have near-record short bets against silver and that is something that traders and investors should watch closely. 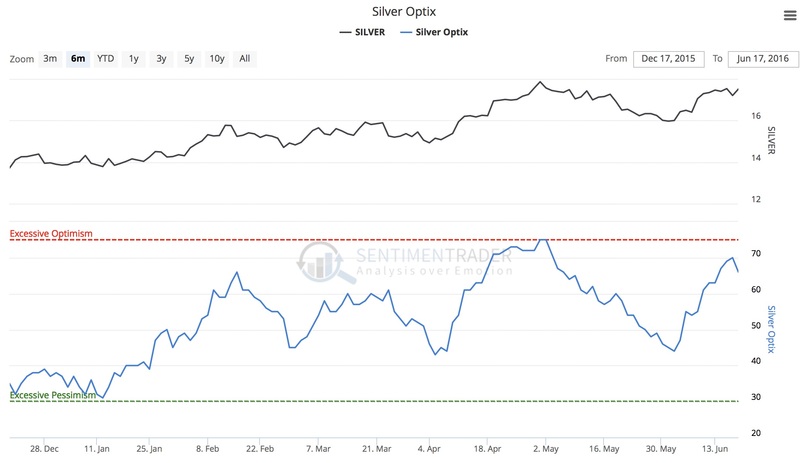 King World News note: I would just add that sentiment for silver has been tumbling and has not yet reached the level of “Excessive Optimism” (see multi-year silver sentiment chart below). 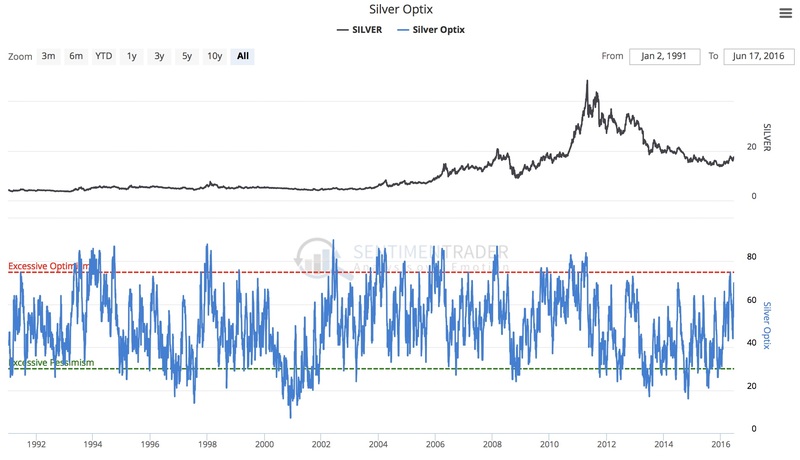 King World News note: You can see how many times there was “Excessive Optimism” in silver in its previous bull run (see 25-year silver sentiment chart below). 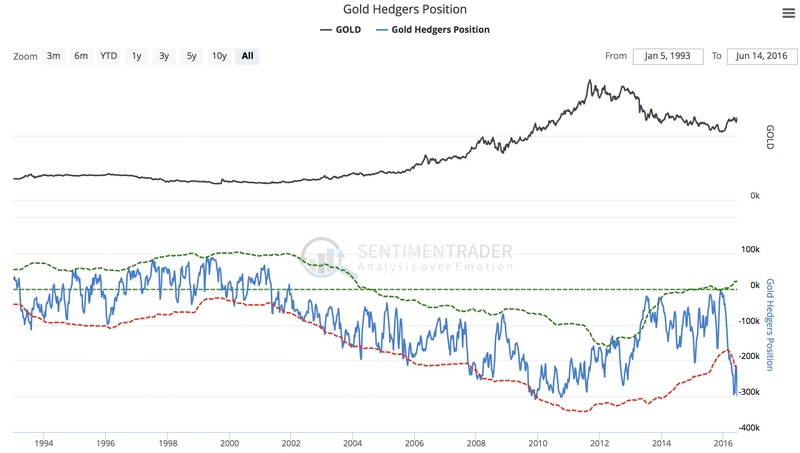 King World News note: It is also important to note that sentiment for gold has been strengthening and has now reached the level of “Excessive Optimism” (see multi-year gold sentiment chart below). 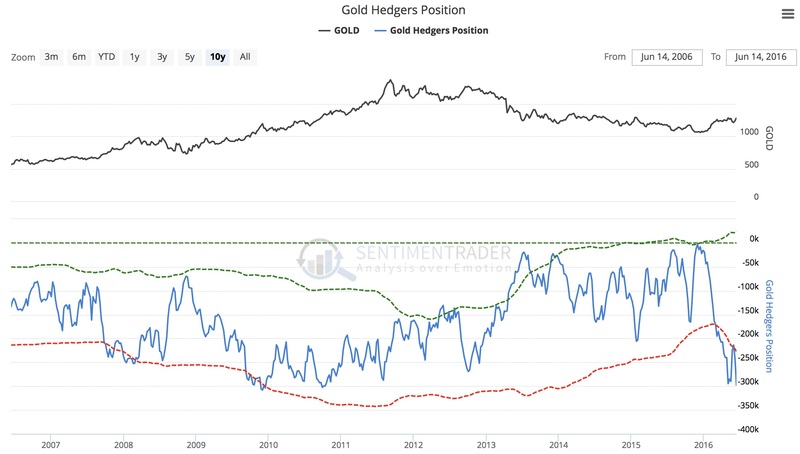 The fact that sentiment in the gold market has finally entered the “Excessive Optimism” level is yet another signal that gold has entered the next leg higher in its secular bull market. If you look at the chart above, the last time there was “Excessive Optimism” in the gold market was in late 2011, when gold was in the final stages of the first leg of its secular bull market advance. 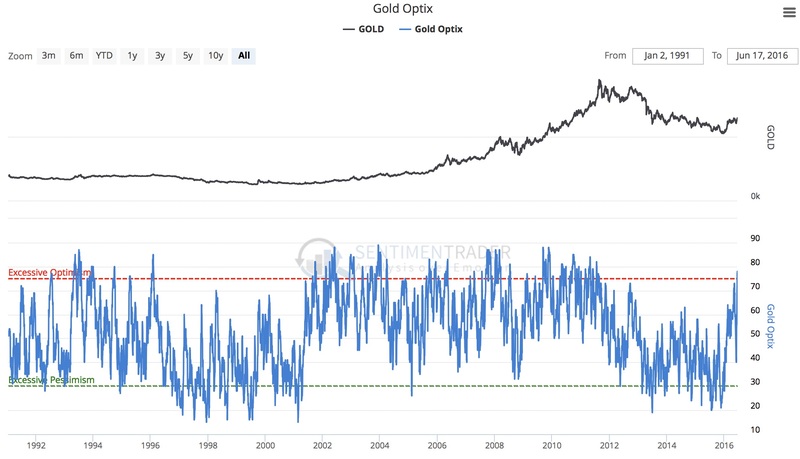 And when you go back to the beginning of the bull market in gold in 2001, you will see that was the first time in that decade that gold sentiment hit the “Excessive Optimism” level — as the gold bull market kicked off. 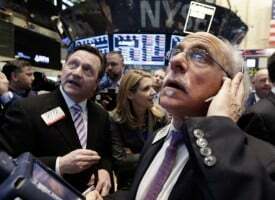 That is why it is so positive medium- to longer-term that we are now seeing “Excessive Optimism” once again. It is a clear signal that the next leg higher of the secular bull market is now underway, even though a caution flag is raised in the very short-term. 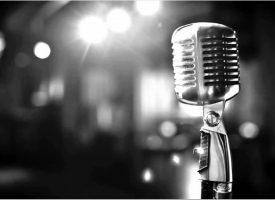 ***KWN has also released an absolutely jaw-dropping interview discussing the gold and silver markets with the man who advises the most prominent sovereign wealth funds, pension funds, hedge funds, and institutional funds in the world and he discusses the gold and silver markets, coming chaos and much more! To listen CLICK HERE OR ON THE IMAGE BELOW. 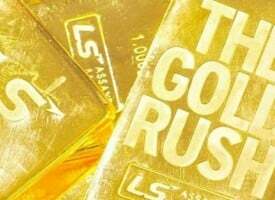 ***Also just released: ALERT: Whistleblower Maguire Warns Massive Stampede Into Gold Taking Place As Elites Lose Control CLICK HERE.